This year there are 390 students with 18 sections and construction of the building’s new wing has been completed. Mr. Buccola also has his own classroom for the first time in the five years he has worked at the school. In previous years, he has taught in the auditorium and art room. Mr. Payton, now is in his sixth year at the school, also expressed his excitement about the new construction. Top photo: Kindergarten teacher Lisa Bohleber helps student McKinnley Hutchinson get acclimated. Scroll down for more photos of Roanoke Avenue Elementary School and images of renovation work that has been completed in Pulaski Street School and the middle school. Principal Thomas Payton helps first grader Aubrey Evans find her class. Reading teacher Corrine Arrasate helps children off the bus. Jen Boese gets emotional waiting for her daughter Adelaide, 5, to get off the bus. Teacher assistant Christine Santos helps her student McKinnley Hutchinson put his lunch away. Elizabeth Przyborowska comforts her son Ibrahaim, 5, in his kindergarten classroom. Kindergarten teacher Jennifer Barth and teacher assistant Lynn Bigrow in their new classroom. Kindergartner Edward Stackevicius waits for other students to get off the bus. ENL teacher Diana Leifsson helps second grader Brianna Carrillo find her teacher. Music teacher Roy Buccola with his kindergarteners in his new classroom, which has plenty of room to move and dance. Roanoke Avenue Elementary School’s playground is under construction and should be finished by Sept. 15. Middle school principal Andrea Pekar helps seventh grade students Morgan Dunn and Skylar Wicklund find their classrooms during a tour of the building last Monday. 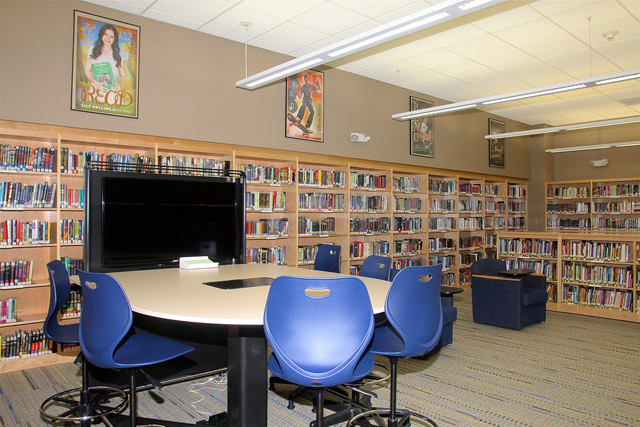 The middle school library was renovated earlier this year. The middle school cafeteria was painted last week. Pulaski Street School custodian Claude Pragliola installs shades in the new science lab. The Pulaski Street School’s new cafeteria can accommodate seven classes at a time during lunch. 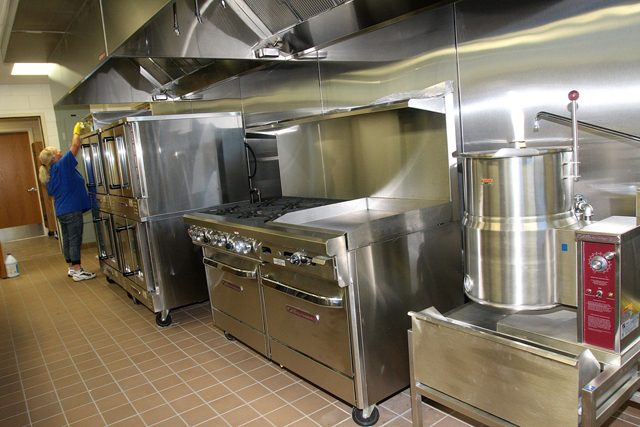 Cafeteria worker Sue Vega cleans the new stainless kitchen equipment.